Dogwood launched our Ban Big Money campaign in April 2016. Since then, we have been demanding changes in campaign finance laws and holding B.C.’s governing parties to account. We were instrumental in helping campaign finance become a key election issue and we are pleased to have played a significant part in the effort to get voters who care about transparency and accountability to the polls. Since then, not only have British Columbians elected a party that has publicly stated Ban Big Money is a priority for their government, all three parties have now publicly expressed their support, meaning Ban Big Money laws are certainly on the horizon. We are excited to be able to work with parties across the aisle to create the gold standard of Ban Big Money legislation. We are pleased to present our support for campaign finance reform that prioritizes banning donations from corporations, unions and out-of-province donors, on behalf of 20,565 British Columbians across the province to government and opposition MLAs. We’ve asked them to consider this petition and the people who signed it as they work towards transparency and accountability in government decision-making. The Ban Big Money campaign has primarily focused on eliminating corporate, union and out-of-province donations, but we know the legislation will need to be more inclusive and detailed. However, because British Columbia has never had campaign finance laws before, we’ll need to start from scratch to determine what the gold standard of campaign finance laws actually is. So, in collaboration with the University of Victoria’s Environmental Law School, we ran a comparative analysis of policies across the country to identify best practices. We then took the best practices found in Canada and asked our supporters what they thought an appropriate Ban Big Money law should look like. The polling we conducted through Insights West in April 2016 indicated British Columbians were comfortable with individual contributions of less than $1,000 — on average, $709. At the federal level, a political party and local candidate can each receive $1,550 (increasing by $25 each year) from an individual contributor. The lowest limit across the country is in Quebec where the limit is $100, while the largest limit is in Nova Scotia at $5,000 per year. When we asked Dogwood supporters about individual contributions in our survey, 55 per cent responded in support of an individual contribution limit less than $1,000, while 22 per cent responded in support of a $100 limit. The limit for how much can be given anonymously varies largely across the country, ranging from no anonymous donations allowed (in Quebec, Nova Scotia, PEI, New Brunswick) to anonymous donations accepted up to $100 (in Nunavut, Northwest Territories and Newfoundland). 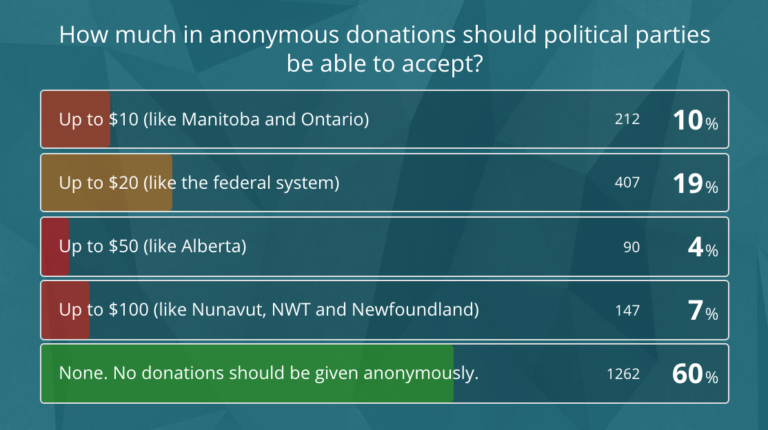 60 per cent agree donors should not be anonymous. Across the country, Ontario is the only province that offers real time reporting and disclosure of donations. 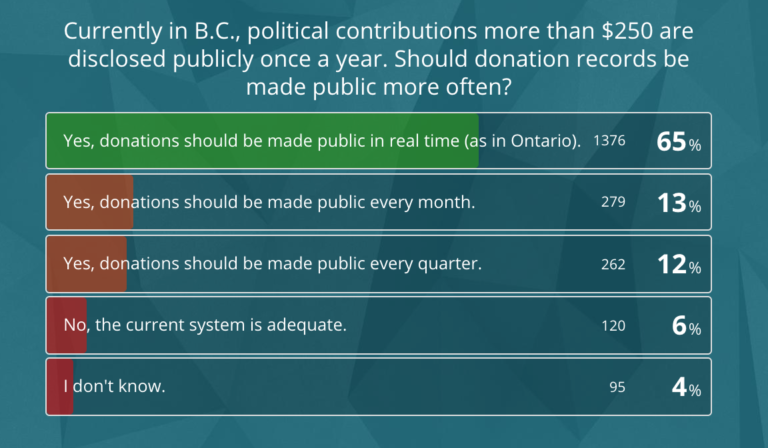 65 per cent of survey respondents agree donations should be disclosed in real time. In response to some of the criticism that took place during the provincial election about employee lending and in-kind donations, we asked Dogwood supporters for their opinion — 87 per cent of respondents agree in-kind donations and employee lending should not be allowed. Per voter, B.C. has the highest campaign spending limits in the country. 84 per cent of respondents agreed the amount parties and candidates spend during a campaign should be lowered. There are several ways to determine this, yet best practice indicates the limit should be determined by the number of voters in each riding. There are three ways political parties could supplement donations and support their campaigns through taxes. Most survey respondents agreed with some type of public support to offset campaign expenses in lieu of Big Money donations. Political parties could be reimbursed for some election expenses from tax dollars, as is allowed in Saskatchewan, Manitoba, Ontario, New Brunswick, Nova Scotia, PEI, Newfoundland and at the federal level. 23 per cent of respondents agreed this was the best option. Political parties could be awarded tax dollars based on the amount of votes they receive, as is the system in Ontario, Quebec, New Brunswick, Nova Scotia and PEI. 15 per cent of respondents supported this option. As is currently allowed in B.C., tax credits can be issued to reimburse a percentage of a contribution from a donor. 15 per cent of respondents supported this option. 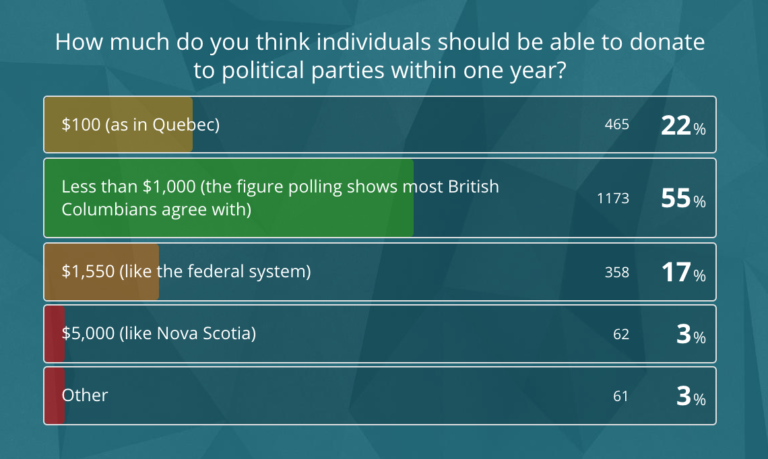 38 per cent of respondents felt political parties should not be allowed to access tax dollars for campaign purposes. As suggested by Attorney General David Eby, there is a possibility that Ban Big Money laws could be imposed retroactively to the provincial election on May 9, 2017. 60 per cent of our survey respondents agreed with this suggestion. John McCain, the multi-term U.S Senator from Arizona that has had a long-time interest in campaign finance reform, has said as soon as new tough political donation rules are established, big corporations, lobbyists, criminals and party hacks get to work finding and exploiting loopholes. He suggests campaign finance laws be updated every decade to close these loopholes. We asked survey respondents if they agreed that B.C.’s Ban Big Money legislation includes a provision requiring the legislation to be reviewed and revitalized every decade — 90 per cent agreed. As “creatures of the province”, municipal campaigns are governed by rules laid out by the provincial government. 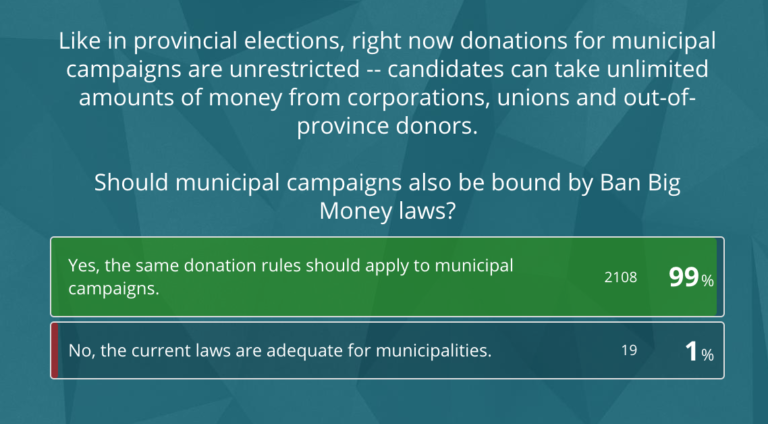 99 per cent of survey respondents believe municipal campaigns should be under the same Ban Big Money laws as provincial campaigns. 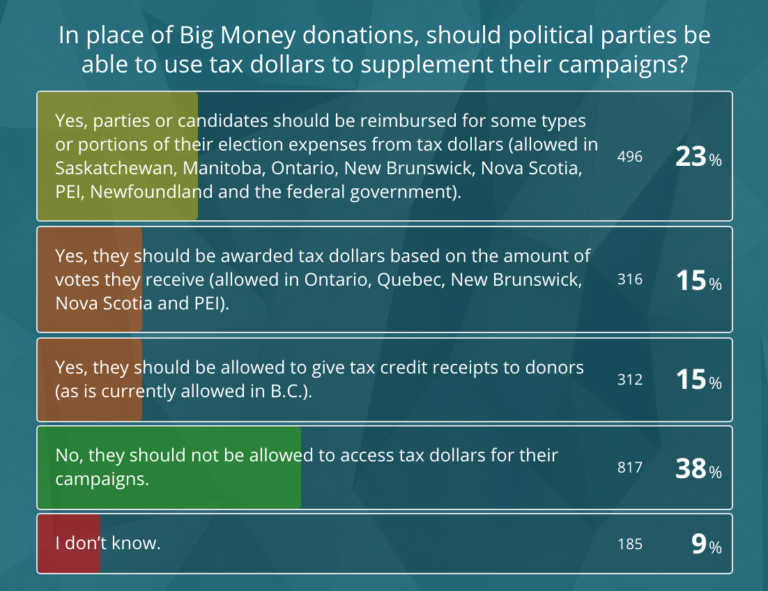 Based on the results of our cross-Canada analysis and our supporter survey, Dogwood has developed a bullet point list of what we think Ban Big Money legislation should look like. After years of being silenced by Big Money, British Columbians won’t settle for anything less than the gold standard. This is the standard we will use to measure any campaign finance laws that are introduced. Limit on individual contributions: less than $1,000 each year. A ban on all anonymous donations. Donations should be publicly disclosed in real time. In-kind donations and employee lending should not be allowed. British Columbia should reduce the amount of money a political party can spend in each election. A fair system of public supplementation of campaign expenses, including the current tax return system, may be allowable. Laws should be imposed retroactively back to May 9, 2017. The new legislation should include a provision that requires campaign finance laws to be revisited and reviewed every ten years. All these laws should also be applied to municipal campaigns and elections. Please help us ensure Ban Big Money laws are the gold standard. If there is any tax deduction for political donations, then tax money is being given to the parties and since we can assume this will be the case the fairest method of subsidizing the parties is the per vote subsidy. 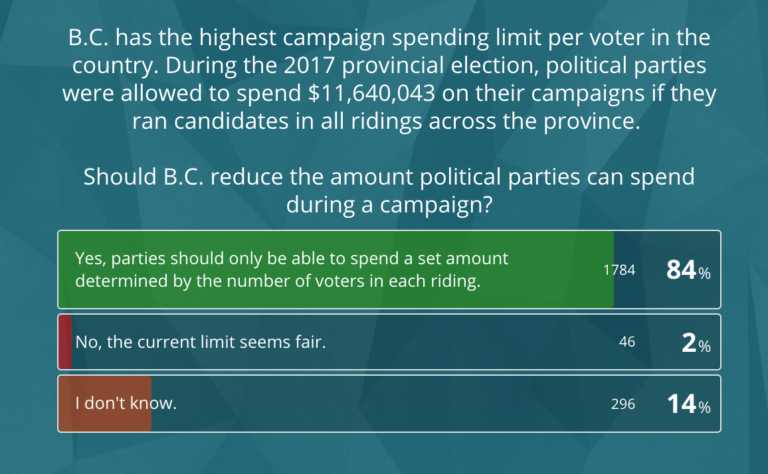 Also probably the best way to fairly limit the per riding spending limits is by the physical size of the riding rather than by the number of voters. These limits should be very low. A beautiful job, so many bases covered! Thank you, volunteers, will keep fingers crossed that we make it into law. Thanks for doing this. Keep up the good work. An excellent summary…an GOLD standard! $1000 is a large and impossible to afford donation for a large proportion of the eligible electorate, particularly young voters. The older generations and better off will be over-represented at this upper limit. Revisit and Review to close loopholes every decade is too long. Egregious loopholes that come to light should be dealt with in real time. Revisits, Reviews and Resolution should be a continuous pro-active process. A lot of harm can be done in a decade as we have seen in BC! I believe it’s time to change the rules and agree with the survey results. Thank you for your diligent effort. Ban law firms from contributing – they then get contracts from government and throw cases by withholding evidence that incriminates government for wrongdoing against other constituents. I feel that $1000 is too low a limit for donations, considering the cost of even print advertising. $1,500/yr is within the means of many ordinary voters with a less than average income level and it’s a case of what one’s priorities are. The current tax incentive is good for seniors. I fear that loopholes will be found around fund-raising dinners etc. This will change everything – if implemented as per the survey results. • Employee lending should not be allowed. * In-kind donations should be identified and restricted to volunteer time and …..(state allowable exceptions and limitations).